Mix 2 TABLEspoons of White Elmer’s Glue and 4 teaspoons of water (and food coloring if desired) in a plastic bag. Seal the bag and set it aside. Make as many bags as you will need in advance. Add 4 teaspoons of the Borax solution to the plastic bag with the glue mix. Mix the ingredients around in the bag, and once it starts to all stick together, you can remove the “slime” from the bag and play with it. It will get less sticky as you continue to play with it. Mix 1 cup of dry cornstarch with 1⁄2 cup of water. (You can add food coloring to the water if you’d like.) This mixture has interesting and messy properties. Try letting the Oobleck run through your fingers, but also try to squeeze it and see how it has the features of both a liquid and a solid. Experiment with different amounts of water and cornstarch to see what is the best Oobleck for you. Note: Do NOT pour Oobleck down the drain. Because it can act as a solid, it can block your pipes! Oobleck dries out on your hands and clothes and wipes off easily. 3/4 Tablespoon glycerin. Glycerin can usually be found in the pharmacy aisle of a grocery storealong with other creams and oils for skin treatment. (This isn’t required, but it will help the bubbles last longer. 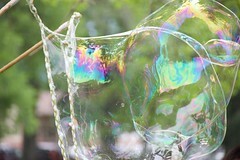 Other recipes we use will have corn syrup, surgical lubricant, or other sticky substances to make the bubbles sturdier. You could try your own additions to see what happens! Stir these ingredients together gently. Ideally, let the mix sit out for a day to age. It’s even better this way, as alcohols in the detergent evaporate and leave behind a longer lasting bubble solution. Blow bubbles through wands, string, pipes, or anything else you have around your home – even your own hands. Here’s our “Super Bubble Recipe,” the one that we use in the Parks. It takes some more ingredients that are harder to get and take a little more time to mix, but we rely on this in order to make the giant bubbles that we put in our buckets and form from loops of cotten yarn tied to wooden dowels.